If a replica for the VM that you plan to replicate already exists in the DR site, you can map the original VM in the production site to this VM. For example, you can map the original VM to a VM replica created with another replication job or restore a VM from the backup on the target host in the DR site and map the original VM to it. You can also use replica mapping if you need to reconfigure or recreate replication jobs, for example, split one replication job into several jobs. During the first run, the replication job calculates the differences between the original and mapped VM. 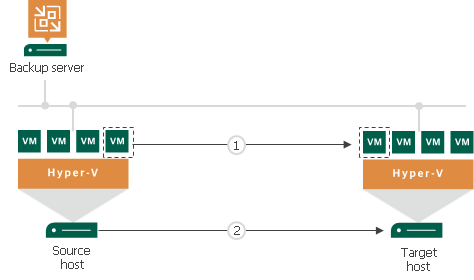 Instead of copying and transferring all data of the original VM, the replication job transfers only incremental changes to synchronize the state of the mapped VM with the state of the original VM. One restore point will contain the latest state of the mapped VM. The other restore point will contain the latest state of the original VM on the source host. All subsequent runs of the replication job will be performed in a regular manner: Veeam Backup & Replication will transfer only incremental changes to the target host. [For legacy replicas] The legacy VM replica to which you map the original VM must not have any checkpoints. Otherwise, replica mapping will not work. [For snapshot replicas] If a snapshot replica to which you map the original VM has any checkpoints that were created by Veeam Backup & Replication, for example, with a replication job run on another backup server, Veeam Backup & Replication will identify these checkpoints as valid restore points for the VM replica and, additionally, will create one new restore point during the first run of the replication job. For example, if a VM replica on the target host has 3 checkpoints created with Veeam Backup & Replication, after the first run of the replication job, you will have a VM replica with 4 valid restore points. If a snapshot replica to which you map the original VM has any checkpoints that were created outside Veeam Backup & Replication, for example, triggered manually by the user, Veeam Backup & Replication will not identify them as valid restore points. During the first run of the replication job, Veeam Backup & Replication will create 2 new restore points as described in the procedure above. For example, if a VM replica has 2 checkpoints created in Hyper-V Manager, after the first run of the replication job, you will have a VM replica with 2 restore points. 2 checkpoints created in Hyper-V Manager will remain in the checkpoint chain. However, you will not be able to see these checkpoints in the Veeam Backup & Replication console and will not be able to use these checkpoints for failover and failback operations.